On face value, Chesterfield’s fury over Pompey’s approach for their manager is understandable. But you should never take anything at face value in this game. The outrage over the timing of the Blues stating their intent to speak to Paul Cook was heard along the M1, around the M25 and loud and clear down the A3 to Fratton Park. Spireites fans sprayed Pompey’s Facebook wall with the kind of language usually seen down Specks Lane and around the back of the North Stand. They contained their fury to 140 characters on Twitter but there was no such economy on the post-match football phone-ins up Derbyshire way. Their ire was understandable. After all, Cook and his team were gearing up for one of the biggest games in the club’s history, as they aim to make it to the Championship. To think the Blues have come knocking on the off chance of a warm welcome, though, would be to ignore the mechanisms which make the game operate. Hardly rebuffing Pompey’s overtures then. ‘Somewhere along the line loyalties will get tested,’ the scouser continued. Nope, still hasn’t knocked it back. ‘In respect to Portsmouth, they haven’t got a manager,’ Cook went on to say, as he defended his suitor’s approach. Okay, Cook isn’t saying wheel me out at Fratton Park in front of the dugout with a scarf to hold aloft but he clearly fancies the job – and Pompey know it. We’re not talking anything illegal, underhand or Machiavellian happening for that situation to develop. In football, as in life, people talk. And if Cook was keen on becoming Andy Awford’s successor, it wouldn’t be hard for the club’s board to find out. No outfit would make an approach, in the manner Pompey have, without the conviction it was worth it. Even chief executive Chris Turner’s initial indignant tones receded, instead admitting they can’t continually resist further overtures. A move for Cook presents obstacles to overcome but not hurdles which are insurmountable. 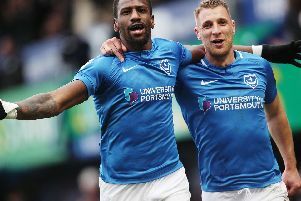 The release clause, in the region of £150,000, will test Pompey’s desire to land his services. But then there are the logistics of Chesterfield’s season potentially running until May 24 and the League One play-off final. That will cover a period where decisions will need to be made on whether to offer new deals to the 11 out-of-contract Pompey players. The fact Oxford are loitering around striker Ryan Taylor with intent shows the dangers of lingering for too long. With hundreds of players looking for a new club this summer, now is the time the groundwork is put in on that front. What is clear is supporters aren’t put off by Cook not having the box office name of others. The fear was an underwhelming response to news of Pompey’s interest. It’s hasn’t been the case. Out-of-contract Martin Allen has support. Phil Brown has still to sign a new Southend deal and other names could yet emerge. When analysing how the race plays out, it will pay followers to afford as much attention to what isn’t said as what is.